Very profound and probably way too common. We all have goals in life. But sometimes we are so focused on the end part that we forgot to enjoy the journey. Success in achieving any goal is not defined by just to moment of triumph but by every failure you have encountered to achieve it. Indeed! The enjoyment of every second (as much as one can) is a worthy investment of time. Characteristic of all of us. We really need to live. 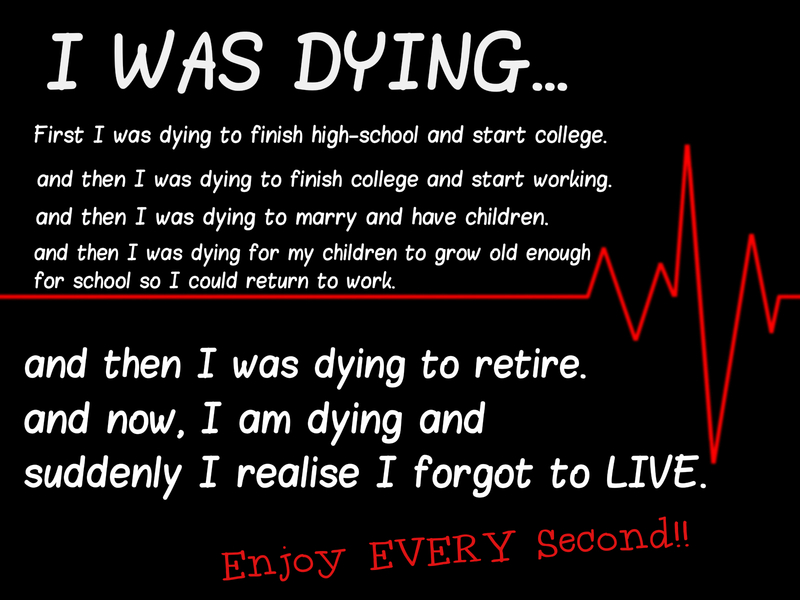 And still wrong focus…We should be thankful for what we have, especially on our deathbed. We should be thankful for the special people in our life, what we have accomplished, special moments in our life, however rare. It may be more than most..we should be thankful for a life lived. No ONE enjoys life every second. the best you can hope for are the seconds that create lasting moments. There’s nothing worse than regret. You can’t change anything on your deathbed, so give thanks. Most people I know live for tomorrow and it never comes. So wrapped up in their lives, the materialism, the mind games. I feel sorry that in the end, life will get through to them when its too late to change anything. Well having nearly died on at least 6 occasions I have taken those reminders seriously! Oh so true! It seems we are always waiting . Waiting for what? Always for life to be better or easier or … Never stopping long enough to enjoy what’s in front of us – our moments. That’s all we really have – these moments for today. We can’t keep living in the future.